I thought the above graph was interesting - I found it on The Huffington Post and thought the accompanied article was very interesting, especially when you constantly hear right-wing sources claim there will be a Republican takeover of the House and the Senate this fall. 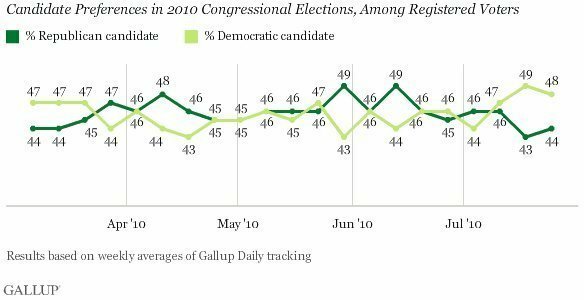 Last week’s Gallup result showed Democrats with a six-point lead (49% to 43%), a result that I argued was likely the sort of random statistical “blip” we should expect from time to time with this sort of tracking survey. This week, Gallup reported a Democratic margin is a slightly narrower four points (48% to 44%), but Gallup’s analysis noted that it “marks the second straight week in which Democrats have held an edge of at least four percentage points” and “the first time either party has held an advantage of that size for two consecutive weeks” in Gallup’s tracking.